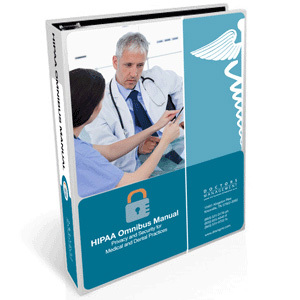 This manual is designed to be the official HIPAA Privacy & Security policy and procedure manual for your medical practice! You will receive an electronic copy of the manual on a CD with Microsoft® Word files that can be easily customized with your practice information and any specific procedures based on your practice's specific approach to HIPAA Privacy & Security. Developed by compliance experts who have trained thousands of medical practice employees and physicians, the manual is well-organized and structured so that you do not have to reinvent the wheel! The HIPAA Privacy & Security Manual contains the basic HIPAA privacy implementation information, all of the forms, policies and procedures needed, plus comprehensive Privacy & Security training presentations necessary for implementation of all the currently approved HIPAA Privacy & Security regulations. Required computer programs: Microsoft® Word and Adobe Reader. NOTICE: It is your duty as a medical or dental practice to implement the required training and/or tools into an active compliance program for your practice and its employees. While this kit, manual or training includes the tools you need to do so, the purchase of this product alone does not ensure compliance.